Ricardo Padilla and his wife, Cindy Padilla, his high school sweetheart and also a CSUF graduate, along with their baby girl, Cadence Padilla. Padilla credits his wife, an ICU nurse at UCLA, with supporting the family financially while he goes through medical school. Back when Ricardo Padilla was an undergrad at California State University, Fullerton, he figured he would study to become an athletic trainer and leave it at that. But once he began taking classes in the Department of Kinesiology at Cal State, faculty and advisers began to encourage Padilla to set his academic sights higher. 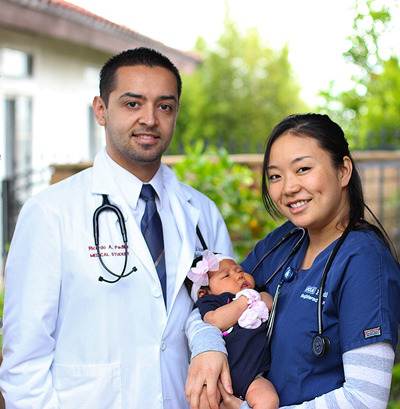 That encouragement ultimately led Padilla to earn not only a bachelor’s degree in Athletic Training and a master’s degree in Kinesiology from Cal State Fullerton, but it helped him land a full-tuition scholarship as a medical student at the Keck School of Medicine at The University of Southern California (USC). Padilla, 27, credits his experience at Cal State Fullerton with prompting him to take his academic and professional pursuits to a level that he had not previously envisioned. Padilla’s experience at Cal State Fullerton is just one of many stories behind Cal State Fullerton’s distinction as a top degree-granting institution for Latinos studying to enter the health profession. According to a recent report from Excelenica, a research and policy organization that focuses on Latino college completion, Cal State Fullerton is one of the top 25 institutions where Latinos earned bachelor’s degrees in health in 2012-13. Cal State Fullerton employs several specific practices that Excelencia says can be replicated to increase student success. For Padilla, who is the son of working-class immigrants from Mexico, there wasn’t a particular program that propelled him toward academic success. Rather, he found excellence to be part of the school culture. For instance, once he entered his studies in the Department of Kinesiology, he found the environment rich with people who were passionate about research. As an undergrad, Padilla worked a five-semester clinical internship as an athletic trainer. “I would be in a class at 11 a.m. learning about some sort of rehabilitation, and by 1 p.m. I was at the clinic applying it,” Padilla said. For his master’s degree in Kinesiology, Padilla wrote a paper that dealt with the prediction of injuries among collegiate runners. Padilla is currently a research assistant for the orthopedic department at Children’s Hospital Los Angeles as well as for the Emergency Department at USC. His research adviser at USC is Dr. Cynthia Bir, lead scientist for the shows “Sport Science” on ESPN and “Fight Science” on the National Geographic Channel. Padilla is pursuing a career in trauma and sports medicine. Jamaal Abdul-Alim can be reached at dcwriter360@yahoo.com. Or follow him on Twitter @dcwriter360.